This is the third year that the 1-2-1 support programme has run through a partnership between the GLL Sport Foundation (GSF) and the London Sport Institute (LSI) at Middlesex University. The programme aims to provide talented young athletes with access to elite level sports sciences support. The collaborative opportunity provides a range of Sport Science support services to GSF athletes that enhance the University’s academic scope and community engagement, whilst providing GSF with a delivery partner for the support for its funded athletes. The partnership is an evidence based approach to educate athletes, coaches and parents and a more in-depth award package. Year 3 LSI Sport and Exercise Science students meet the GSF athletes and both parties then agreed to work together for the year. All student testing programs and interventions are agreed and supervised by the module team. The partnership gives an opportunity for students to work with Elite athletes to gain valuable experience in their final year of study. Research conducted after the completion of the Sport science support programme suggests that 83% of athletes completed the support programme offered to them. This completion rate if an increase on previous years and reflects the changes made to the programme to engage all parties in the process. Figure one indicates the percentage changes in the body composition factors of the athletes after they had completed their support programme. The body composition factors improved by 1% on average with the most improvements shown in the athlete’s overall weight, % muscle and % fat improvement which decreased by 7%, increased by 5 % and decreased by 6% respectably (see figure one). The fat % decreased by 6% which is not a large change but indicates the extent to which the athlete adhered to the programme with the corresponding increase in muscle % also reflecting this engagement. Overall the majority of the performance indicators improved in the manner that exhibited a performance gain. The only indicators that did not show an improvement as a result of the sport science support programme were the strength and anaerobic measures which displayed no change. The flexibility and power tests, indicated the largest overall improvement with a % change of 16% and 14% (see figure.2), which is pleasing and potentially leads to the need for further education on the importance of stretching exercises through the workshop programme. 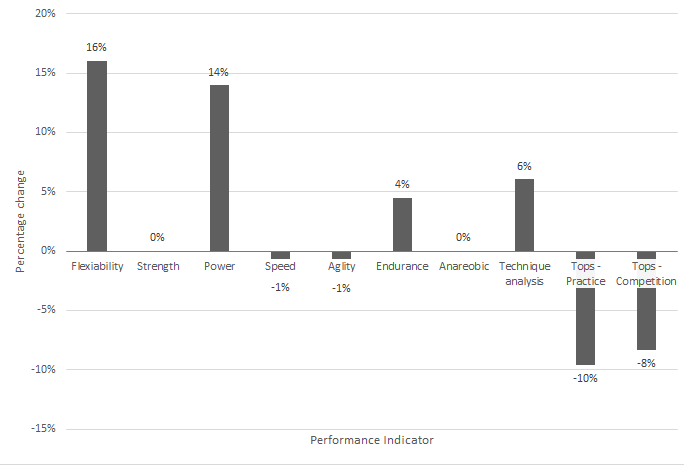 The power improvements are slightly smaller but are in line with the improvement in the flexibility scores due to the link between the two performance indicators. The speed factors improved by on average – 1% which is consistent with the mixed type of athletes that is in the group and the length of time to implement the programme. The range of sports performed by the athletes meant that improvements in speed were limited and mainly with athletes who were not familiar with speed work. The endurance measures improved on average by 4% which is a small amount and but is pleasing due to the increase in the students’ completing a full VO2 test with the athletes. You would not normally see an increase in this figures due to the genetic nature of the VO2 value so to see a slight improvement through the intervention programs is pleasing. The introduction of more biomechanical testing in this year’s programme has seen the introduction of technique analysis which has shown slight improvements of 6%. The improvements shown in this measure are positive and this will be interesting to monitor this as this area of the programme is further developed due to athlete feedback. The psychological skills improvements show a consistent improvement in both practice and completion. The students implement a consistent approach with this section, due to the nature of the discipline, resulting in 10% improvements for practice and 8% competition (figure.2). Although students receive training in the testing procedure to attempt to limit the errors in measurement, this cannot be fully controlled and as such there will be a minimal percentage error associated with these tests. The improvements made could be due to the program implemented but also the athletes learning about the tests and what is expected of them, a learner affect. In future programme perhaps this is an area for development time permitting so that the rests gained can be a true reflection of the effectiveness of the intervention support. In summary the flexibility components showed the greatest improvements (see figure.2). The other sections to indicate large changes are power and psychology sections (see figure.2). Some further programme highlights are the biomechanical and endurance improvements 6% and 4% respectively. There are areas to review and look to improve for next year’s programme however these changes indicate a positive impact on the athletes. The programme again highlights the impact of the programme on future athlete’s careers and the experience the students gain which will undoubtable help them in their future careers. Arrange athletes and students to meet multiple times at the beginning of the year to help with project engagement. Arrange more testing sessions which are set from the beginning of the year to ease the completing of testing and perhaps enable the use of familiarization sessions before the pre testing to increase the accuracy of the data. E-mail invitations have recently been sent out to local athletes for the 2016/17 academic year. If you would be interested in taking part please e-mail gllsportfoundation@gll,org. It gives athletes an opportunity to find out their weaknesses and have a programme written for them to make improvements.